So this morning we left our comfy caravan after re-fixing the flat I fixed yesterday... I still couldn't find the cause of the puncture but it was in much the same place :( . 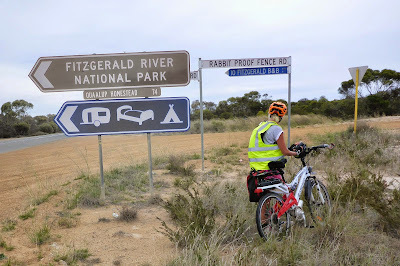 We departed from the Ravensthorpe caravan park and headed West with the wind (yeah!) for 116kms of ups and down. 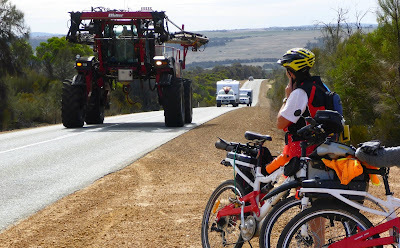 A caravan stopped for us and gave us a donation and had a nice chat, some weird alien agricultural equipment went past, we saw many melons grow alongside the road (apparently not edible), lots of birds including a small flock of tiny lime green parrots. 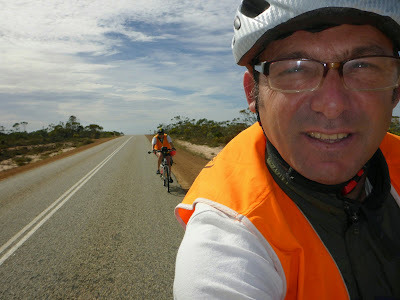 During the ride I got some phone coverage and used it to call my mate Chris re accommodation and a few contacts and made final preparations for Albany, including aligning an ABC radio interview for Thursday! We will aim at arriving at 4pm on Wednesday at the Albany Tourist Information center which marks the end/start of the Bibbulmun track! I hope we make it in time and if late hope they will see where we are on the Spot map. I am getting threats to my (love) life to get a Telstra SIM for my phone as my Aldi phone SIM has been out of action from the SA Eyre peninsula pretty much - despite supposedly using the Telstra network. I might have to succumb as my Aldi SIM is laughing stock at the moment as much as I like them normally :( It covered me everywhere in Tassie/NSW/ACT/VIC so why not in SA/WA?? Anyways.... Tomorrow is our last day of riding!!! !